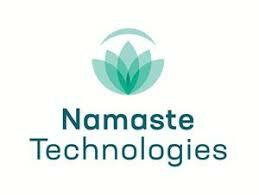 Namaste Technologies Inc. (“Namaste” or the “Company”) (TSXV:N) (FRANKFURT: M5BQ) (OTCMKTS:NXTTF) is pleased to announce that it has closed today its previously announced “bought deal” short form prospectus offering of units, including the exercise in full of the over-allotment option (the “Offering”). Namaste Technologies is Your Everything Cannabis Store™. Namaste operates the largest global cannabis ecommerce platform with over 30 websites in 20+ countries under various brands. Namaste’s product offering through its subsidiaries includes vaporizers, glassware, accessories, CBD products, and medical cannabis through its wholly owned subsidiary CannMart in the Canadian market. Namaste has developed and acquired innovative technology platforms including NamasteMD.com, and in May 2018 the Company acquired a leading e-commerce AI and Machine Learning Company, Findify AB. Findify uses artificial intelligence algorithms to optimize and personalize a consumer’s on-site buying experience. Namaste is focused on leveraging its cutting-edge technology to enhance the user experience throughout its platforms. Namaste will continue to develop and acquire innovative technologies which will provide value to the Company and to its shareholders as well as to the broader cannabis market. This news release may contain “forward-looking information” and “forward-looking statements” within the meaning of applicable Canadian securities legislation. All information contained herein that is not historical in nature may constitute forward-looking information. Forward-looking statements herein include but are not limited to statements regarding the final acceptance of the TSXV, the listing of the Warrants, and use of proceeds, and are necessarily based upon a number of assumptions that, while considered reasonable by management, are inherently subject to business, market and economic risks, uncertainties and contingencies that may cause actual results, performance or achievements to be materially different from those expressed or implied by forward-looking statements. Except as required by law, the Company disclaims any obligation to update or revise any forward-looking statements. Readers are cautioned not to put undue reliance on these forward-looking statements.